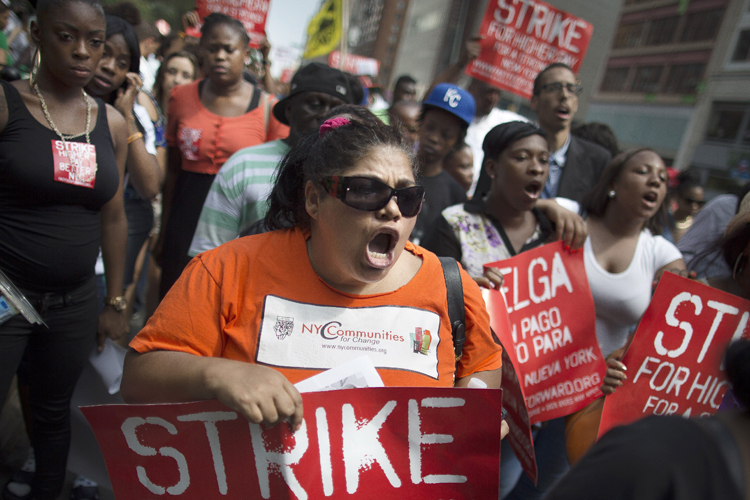 There's a news report that some fast food workers in 100 cities are planning a strike. They want to get paid $15/hour to flip burgers or ask if you want fries with that. Now, don't misunderstand me. There's nothing wrong with flipping burgers or asking if you want fries with that. But if that's your idea of a dream job, then you're a slacker and a drain on society. Running a McDonald's or a Wendy's? That's great. Owning one? Better. Flipping burgers? Not so much. That's an entry-level job, not a $15/hour job. And, if you think it is, you're part of the problem. You know what, though? I think that a one-day strike won't get the job done. You see, if you don't show up for work without calling in sick, it's perfectly fine for the company to fire you. Then, not only do you not have to go to work on Thursday, you don't have to go in Friday, Saturday, Sunday, or any other day that ends in "y." And December is the perfect time to pull a stunt that'll get you canned. Winter's here, it's cold. You got to heat the house. You might even want to get the kids a Christmas present. But, tell you what. Why don't you just not show up on Thursday and tell the kids that it's all Bush's fault or Wall Street's fault. It's not the fault of the Democrats that have extended what would have been a year, year-and-a-half slowdown into a five-year economic disaster with no end in sight. Go ahead and strike. There's plenty of unemployed that would love to take your job. Until they move up to a better job. Then, maybe you'll get your old job back. But not at $15/hour. Is this some Leftist plot to get us to eat our Broccoli? I need to tell the story of how I learned to eat broccoli. It's not really a funny story, although I do remember X1 laughing when it happened. The best way to eat broccoli is to grow it yourself, pick it, steam it and smother it with butter and Basil. They need to take it one step further, they should refuse to vote until minimum wage is.....$100/hr!!11!!!!11! I think it's a great idea. My kid is having trouble finding part time work. Might be some openings soon. If I wanted to pay $15.00 an hour to have someone spit in my food, I would get a housekeeper and treat her very poorly.